USS Midway is an aircraft carrier that served with the US Navy. The ship was launched and laid down during World War Two, but was commissioned just after the war had ended. During the 1940s, 1950s and 1960s, USS Midway was deployed at various times in the Caribbean, with the 6th fleet in the Mediterranean, and at the 7th fleet in the Far East. The most notable achievements during this period were launching of captured German V-2 rocket from her deck (1947), and participation in early operations in Vietnam including her aircraft downing three MiGs. USS Midway was modernized at great expense in the late 1960s, and returned to service only in 1970. USS Midway again participated in operations in Vietnam in the early 1970s. In 1973, she became part of the first forward-deployment of a complete carrier task group to Japan. When South Vietname began to collapse in 1975, the ship returned to the area, and helped in the evacuation of US personnel and Vietnamese during the fall of Saigon to the North Vietnamese. The USS Midway continued to serve during the late 1970s, and 1980s with deployments to the Pacific, (including participating in a 1976 military demonstration to North Korea), and to the Arabian Sea and Persian Gulf during the Iranian Revolution. In August 1990, Iraq invaded Kuwait. USS Midway was deployed to the theater, and participating in the liberation of Kuwait the following year (Operation Desert Storm). 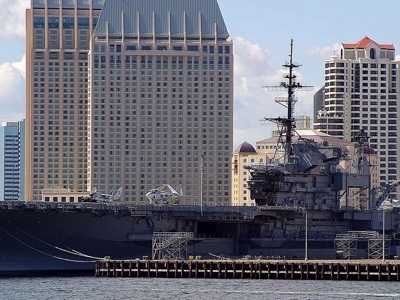 After a long and distinguished career, USS Midway was decommissioned 1992. In January 2004, the ship was moored at Broadway Pier in San Diego, California, and in June of the same year she opened to the public as a museum.